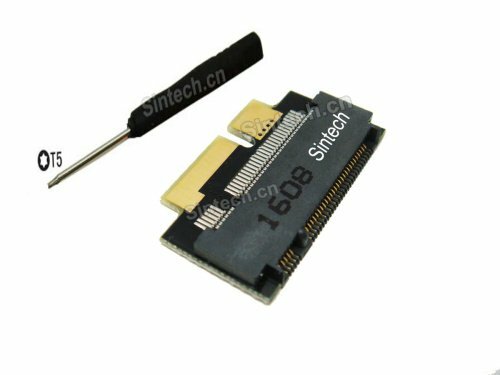 Sintech NGFF M.2 BM Key SSD to 18Pin Adapter Card for Replace Sandisk SD5se2/SDSA5JK ADATA XM11 SSD of Asus UX31 UX21 TAICHI21/31 by Sintech at Pacs BG. MPN: ST5112S. Hurry! Limited time offer. Offer valid only while supplies last. PA5112S NGFF SSD HDD to 18pin as sandisk sd5se2/SDSA5JK ADATA XM11 is used to convert SATA SSD/HDD as SSD for Asus UX31 UX21 TAICHI21/31 Zenbook. 1. PA5112S NGFF SSD HDD to 18pin as sandisk sd5se2/SDSA5JK ADATA XM11 is used to convert SATA SSD/HDD as SSD for Asus UX31 UX21 TAICHI21/31 Zenbook. 5. size with 2280 M.2 SSD is same as original SSD from Asus UX31 UX21 Zenbook: 94mm x 24mm (LxW).